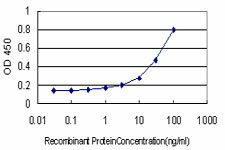 Detection limit for recombinant GST tagged RASA3 is approximately 0.3ng/ml as a capture antibody. Western Blot analysis of RASA3 expression in transfected 293T cell line (H00022821-T01) by RASA3 MaxPab polyclonal antibody.Lane 1: RASA3 transfected lysate(91.74 KDa).Lane 2: Non-transfected lysate. 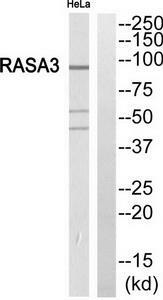 RASA3 MaxPab rabbit polyclonal antibody. Western Blot analysis of RASA3 expression in mouse testis. Western Blot analysis of RASA3 expression in transfected 293T cell line (H00022821-T02) by RASA3 MaxPab polyclonal antibody.Lane 1: RASA3 transfected lysate(95.70 KDa).Lane 2: Non-transfected lysate. 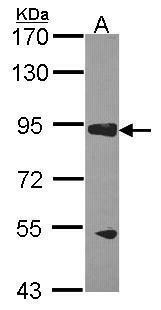 Western blot analysis of RASA3 expression in HeLa (A); SP2/0 (B); H9C2 (C) whole cell lysates. Sample (30 ug of whole cell lysate). A: H1299. 7.5% SDS PAGE. RASA3 antibody. TA308271 diluted at 1:1000. Western blot analysis of extracts from HeLa cells, using RASA3 antibody.The lane on the right is treated with the synthesized peptide.